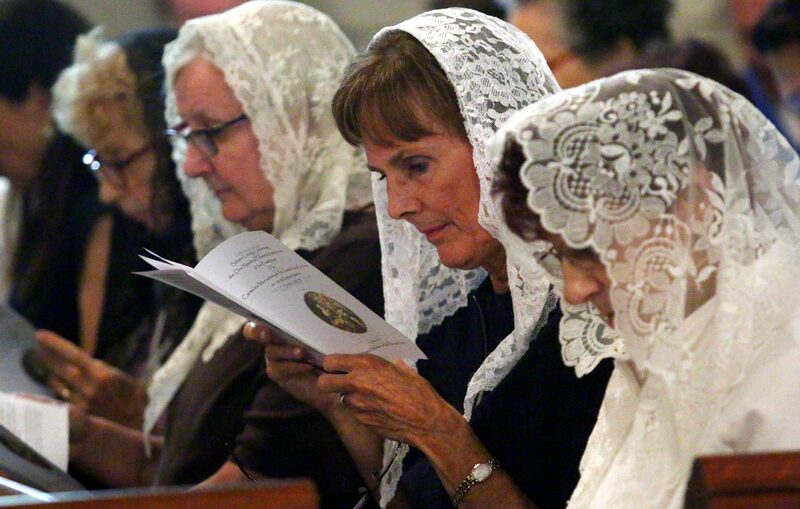 Women follow the Mass with the aid of a booklet for the Mass in Latin. St. Mary’s Quasi Parish in Conshohocken will celebrate its opening Mass in the Extraordinary Form on Sunday, Sept. 9 at 11 a.m.
Father Carl Gismondi from the Fraternity of St. Peter, the newly appointed pastor of St. Mary’s, will preside over the liturgy. All are welcome to attend the Mass, which marks the parish’s appointment as the home for the traditional Latin Mass in the Archdiocese of Philadelphia. Earlier this year, Archbishop Chaput signed a decree approving the establishment of a quasi-parish at the location of the former St. Mary Parish in Conshohocken effective August 1, 2018. The announcement was made in response to an interest for additional pastoral care for those wishing to participate in Divine Worship in the Extraordinary Form. The Priestly Fraternity of Saint Peter provides clergy to serve St. Mary’s Quasi Parish, which is located at 140 W. Hector Street in Conshohocken. For more information, visit https://www.facebook.com/events/452816358551866/.